Given all the tax reforms being proposed under the Trump administration, many Americans are understandably wondering if they will be paying more or less in taxes next year. The answer is that if the GOP tax reform plans are passed, which are highly likely at this stage, then a lot of people will see lower tax effective tax rates in 2018 given increased in tax bracket income thresholds. If they don’t pass the then the published 2018 IRS tax brackets shown below will be in effect. The standard deduction in 2018 will double to $12,000/$24,000 (single/married) under the GOP tax bill. The $4,150 personal exemption will be fully eliminated for 2018. 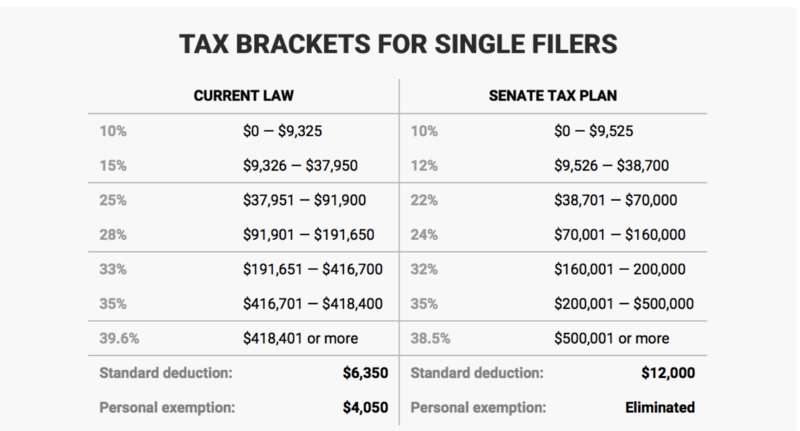 The standard deduction nearly doubles under the GOP/Trump plan, but the personal exemption and several itemized deductions have been reduced or eliminated. As further updates for 2018 come to light with new legislation, I will update the above table and related articles. Connect via Facebook or Twitter to get the latest updates and news related to Trump and GOP tax reform proposals. How will this affect 2018 income tax returns? Is there still a possibility of a refund or will I have to pay, since they won’t be taking as much out of my paycheck, even though my tax rate went down? Trump and all his cronies can go straight to hell just like all those on Social Security who feels they are special and should not have to pay their fair share of taxes like other on retirement do. This whole tax thing is nothing more than a joke. It is a bigger joke than what Reagan did. Under the new 2018 tax law,will my social security benefit be taxed at 100% income? There are no changes as to how SSI income will be taxed in 2018. Current rules apply, with updated tax brackets.